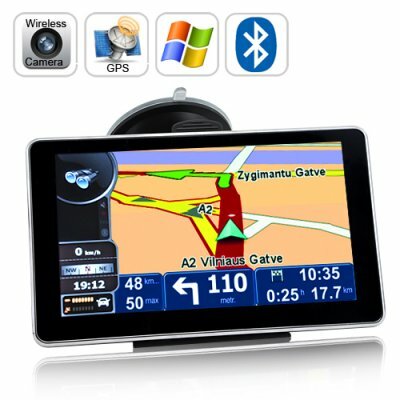 Successfully Added 6 inch HD Touchscreen GPS Navigator (Bluetooth, Wireless Camera) to your Shopping Cart. The new TR20 is a top notch touchscreen GPS navigator that comes with a colorful menu display, multimedia functions, and a rearview wireless camera. Better Viewing Experience: The menu icons on this GPS hand held navigator come with a graphical refresh unlike tradition mainstream models, and presents a more colorful interface with finer gradients. State of the Art GPS Technology: This wide screen GPS navigator supports spoken voice directions, automatic route re-calculation and even the choice of 2D or 3D mapping view that lets you find your way more easily. The Bluetooth function allows you to pair your cellphone with the GPS and make phone calls handsfree. Your driving is safer with this product. True In-Car Entertainment Center: In a nut-shell, you do not have to dismantle your vehicles dashboard and install a car DVD player if you don’t want to. This handheld GPS navigator with built in multimedia applications offers you a variety of entertainment options for using it in your car, including music, video, games and e-book. Additionally, this 6 inch touch screen GPS navigator's FM transmitter along with the Bluetooth feature allows drivers to pair their cell phones with the GPS navigator and enjoy hands free calling and listening to your favorite music through you cars stereo speakers. Car Parking Made Easy: This 6 inch GPS navigator comes with a wireless rear view camera that helps you reverse and parallel park with comfort and ease. The wireless rear view camera gives drivers the confidence in reverse and parallel parking. Further-more, installing this wireless rear view camera is easy and takes a mere few minutes. This ip66 wireless rear view camera is designed to be able to handle the harsh weather of the outdoors such as snow, hail, rain and fog. good product, quality in the materials, 4 days to italy..
Auper structure, a reversing camera receiver sensitive, but it works well. Overall, it was a good buy. I want software/map for europa/skadinavia ???? ?